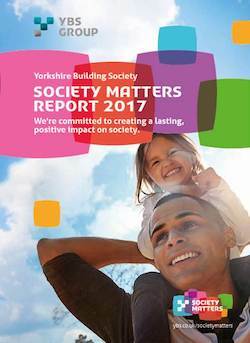 Yorkshire Building Society Group has today published its latest Society Matters report. The report demonstrates the Society’s recent achievements and vision to fulfil its commitment to create a lasting, positive impact on society in the UK, focusing on the key priority areas of Customers, People, Community and the Environment. “Our report this year highlights the progress we have made as an organisation and demonstrates our continued commitment to doing the right thing for our members, colleagues, local communities and the environment. “Yorkshire Building Society was founded more than 150 years ago with a clear purpose: to help people save for what matters to them, and enable them to buy a home of their own. “This strong ethos continues to run through the heart of our organisation today. As a mutual, we are owned by our customers, who are members of our Society. We exist for their benefit and to provide them with real help with their real lives.